Seth Schenck sprinting the last 100 meters, winning the mile by just under ten seconds with a time of 4:31.53. Even with a ten second lead Schenck was trying to beat his career best of 4:30.49, gave him a second place finish at state last year. 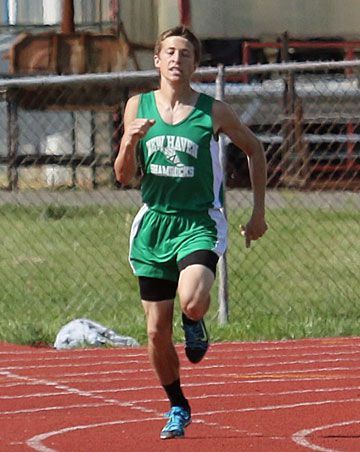 It was just a year ago when Seth Schenck, a junior at the time, ran in his first track meet. Little did anyone know he would go from being a great cross-country runner to the FRC Male Athlete of the year. 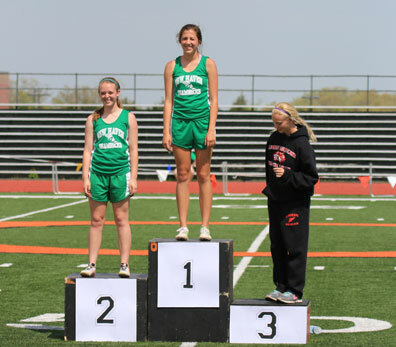 Considering the fact in both the 800m and 1600m Schenck was undefeated against teams in the conference and currently holds the best times for both events in Class 1, it was an easy decision for the FRC coaches to select Schenck. 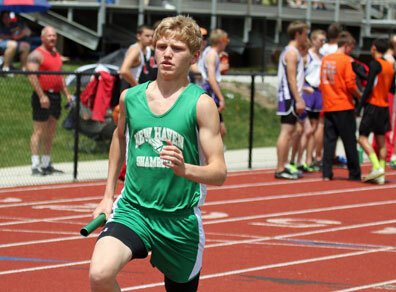 Pictured right: Jon Stone enters the first turn in his first leg of the 4x800m Relay. Tucker had a good reason to be “very pleased” with a combined 24 athletes (JV and Varsity) making All-Conference in 21 events. Schenck also part of New Haven’s 4x800m Relay Team (Zach Grater, Keven McDowell, and Jon Stone) who finished second but more importantly ran their best time of the year and will head into districts on Saturday with the top time (8:37.14) posted in Class 1, eclipsing last year’s season best which came in the state finals where they finished seventh. Coach Tucker’s girls team won the school’s first ever Track and Field District Title and this year hope to put on a repeat performance, but it will take the same type of team effort as last year. Tucker will have runners in every event except the pole vault. “The obvious goal is to qualify for sectionals but placing in the top eight is just as crucial because that scores us team points”, said Tucker. Pictured right: Rachel Steinhoff hands off to Hannah Pruessner in the 4x400m relay. 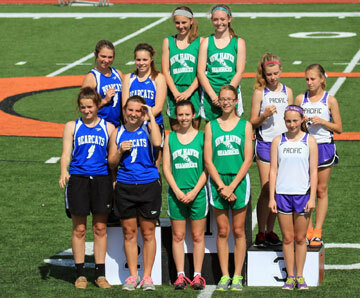 The girls’ relay teams all ran some of their best times on the year. The 4x100m team (Ereka Bailey, Rachel Steinhoff, Emily Kallmeyer, and Molly Munsinger) was just two-tenths of second from their season best of 55.42. The same 4x800m team (Kayla Borcherding , Hannah Pruessner , Hannah Kruse, and Taylor Covington) that finished third at state last year ran their season best of 10:30.48. Last year’s 4x400m relay team have three of their four runners returning, Taylor Covington, Molly Munsinger, Hannah Pruessner, and stepping in to join the three juniors who have been running this relay since their freshman year is Rachel Steinhoff. Monday they posted their season best of 4:13.79, which is currently the top time in Class 1 behind Midway and if you recall in last year’s state finals, Midway beat New Haven while both teams broke the state record. In Monday’s open races Covington ran a career best in the 400m dash (62.91) to finish fifth, but her time is currently the second fastest time in Class 1 right in front of her teammate Munsinger who ran a 62.99, which is third among all Class 1 schools. Covington also ran a career best in the 800m (2:31.55) to finish third and make All-Conference Honorable mention. Click here for important information you need to know about Saturday's District meet. 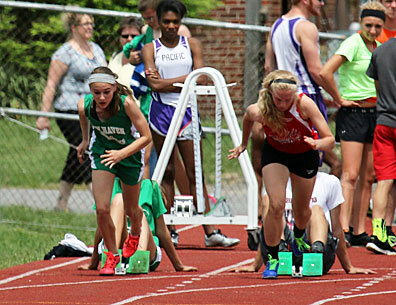 Pictured right: Nichole Zeitzmann busts out of the blocks in the 100 meeter dash.